On a very wet and cold November evening Ian Buxton, a National Demonstrator from Nottingham, journeyed down to Fleet to give us the most wonderful and enthralling demonstration of his interpretation of ‘The Atmosphere of Christmas’. 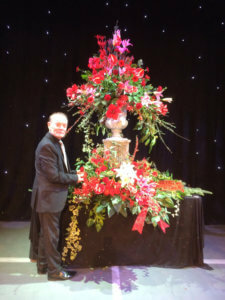 Ian’s sense of humour and chat whist arranging abundant amounts of foliage and stunning blooms was mesmerising. 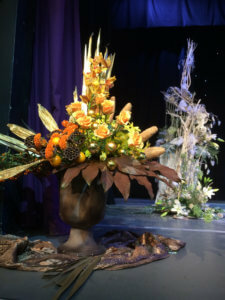 His arrangements were cleverly crafted and each one was created in a different format with inspired colour choices. The audience, of approximately 200 people, at the Harlington Centre, Fleet, greatly enjoyed the demonstration and went away thinking more of 'the Atmosphere of Christmas' rather than the wet weather! Our thanks and gratitude to the staff at the Harlington Centre who helped make this a very successful event for our Club.